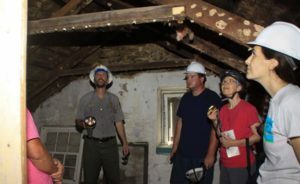 The C&O Canal Trust will be hosting an Open House with free hardhat tours of Swains Lockhouse in Potomac, MD on Saturday, November 5 from 12:00 p.m. – 4:00 p.m. Swains Lockhouse is currently being rehabilitated by the Trust and the C&O Canal National Historical Park as a National Park Service Centennial project to join the award-winning Canal Quarters program. This open house is a unique opportunity for the public to see the inside of this lockhouse, which is currently stripped of all non-historic material, with the historic structure visible for the first time in years. The National Park Service’s Historic Preservation Training Center in Frederick, MD is responsible for the architectural planning and construction work. Swains Lockhouse is located at Lock 21 (mile marker 16.7) along the C&O Canal towpath. It can be accessed by car via Swains Lock Road off of River Road in Potomac. Limited parking is available on site. Overflow parking is available at Pennyfield Lock (3 miles via towpath) and at Great Falls (2.3 miles via towpath). Canal Quarters is a joint partnership between the C&O Canal Trust and the C&O Canal National Historical Park. It provides for the rehabilitation and interpretation of historic lockhouses located along the C&O Canal. Each of the six lockhouses currently in the program has been restored and decorated with authentic furnishings depicting a specific time period of Canal history between 1830-1950. Guests are able to reserve Canal Quarters lockhouses and enjoy an immersive interpretive experience for up to three nights. All Canal Quarters revenue remains within the program for continued maintenance and operations. Swains Lockhouse, when finished, will interpret the 1916 time period of the Canal’s history, when the canal was nearing the end of its commercial life and the area was becoming a tourism destination for hikers, boaters, and nature lovers. The Swain family lived in the lockhouse during the canal period until 2006, operating a concession stand after the canal closed to boat traffic in 1924. Funding for the project is being provided by the C&O Canal National Historical Park, the C&O Canal Trust, the C&O Canal Association, and the Friends of thie Historic Great Falls Tavern. This open house is free to the public and will enable visitors to tour the lockhouse, while learning more about the program and the history of the C&O Canal. Visitors can also enter a contest to win a stay in a Canal Quarters lockhouse. Visit www.canaltrust.org/Swains to follow along with the rehabilitation.